B&O BeoSound 1 review | What Hi-Fi? You wouldn’t expect Bang & Olufsen to follow the footsteps of its peers and make a normal-looking wireless speaker, would you? This, after all, is the company responsible for the Dalek-like BeoLab 5 - which looks and sounds stunning at £15,500. The Danish style kings have always thought out of the box when it comes to designing hi-fi, and the new B&O Beosound 1 speaker is no different. The Beosound 1 looks as if it belongs on the thick, glossy pages of a coffee table book. Or in the stylishly minimal interior of a software tycoon’s house. 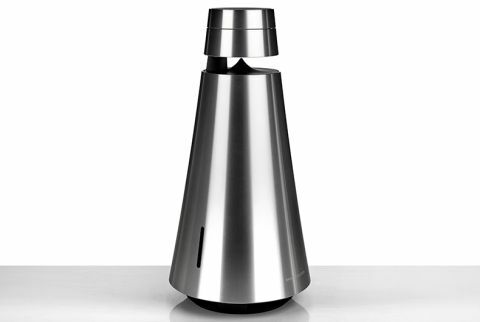 You’ll either be enticed by its sleek, conical aluminium body, or wonder why it looks like a thermos (or a plunger-less Dalek). Once placed in a normal living environment (or in the What Hi-Fi? listening rooms), the B&O speaker actually doesn’t seem outlandish at all. It looks almost… normal. The build is rock solid, the finish is impeccable, and we’re fond of the way the top control dial looks like it’s floating above the main body of the speaker. In reality, there’s a sturdy strip connecting the two components, but the overall effect is rather elegant. The compact design means it will fit into most small spaces, but we’d give it plenty of space around to take full advantage of its 360-degree sound dispersion. The speaker features B&O’s Acoustic Lens Technology: a 4cm full-range driver housed in the top dial fires down into a precisely shaped guide to ensure the sound is spread out evenly in all directions. Coupled with a 10cm bass driver placed at the bottom of the speaker that also fires downwards and out evenly, the ensuing result is a truly 360-degree sound that’s uniform from all angles. Both drivers are powered by individual class-D amplifiers. Another attention-grabbing element is that top dial. It doubles up as the volume dial and controller. The gentle notches and smooth turning of the dial are lovely to use, and while the touch capacitive controller doesn’t have any icons as on the Naim Mu-so (which is slightly more satisfying to use), it does have some nifty features. Tap the top to turn the Beosound 1 on, double-tap to change sources, and swipe left or right to skip or rewind tracks. You can do this from any side, too, as the speaker has a proximity sensor that orientates itself according to where you are standing – pretty clever stuff. You won’t find any manuals in the box (it contains only the speaker and a mains cable – no extra frills here), which means a trip to B&O’s website for the full guide on how to operate the Beosound 1. Set up isn’t too cumbersome, although we wish we didn’t have to download two separate apps to do so. You’ll need the B&O BeoSetup app to do the actual setting up (connecting to your home network and enabling wi-fi use), but then you’ll need the B&O BeoMusic app to access all your music and control playback. On the plus side, they’re both free to download, have a simple, minimal interface and are easy to use. If the LED on the speaker is a solid white – you’re all set and connected. Once you’ve connected the Beosound 1 to your network, there’s a whole world of wireless streaming available to you. You can stream songs from your devices (smartphone, tablet, laptop, or NAS box) using a variety of protocols: Bluetooth, AirPlay, DLNA and even GoogleCast. Streaming is mercifully swift and uninterrupted once you get everything set up. The speaker supports high-resolution streaming up to 24-bit/192kHz, so don’t ignore those hi-res WAV and FLAC files stored on your NAS in favour of streaming only MP3s from your smartphone. It also supports music-streaming services such as Spotify Connect, Deezer and TuneIn internet radio. We’d struggle to run out of music to listen to with the Beosound 1 – as long as your devices all support wireless or Bluetooth streaming. If you want to hardwire any old school music players, you’re out of luck, as the only physical connection is a wired ethernet port. Its bigger brother, the Beosound 2, does have a 3.5mm auxiliary input hidden in its base, but the Beosound 1 is purely wireless. The B&O is portable, too. Its pricier sibling is mains-only, but the Beosound 1 can roam free. The battery life is a respectable 16 hours if played at neighbour-friendly volumes. If you want to blast music out at full volume (and it does go really rather loud), then you’re looking at more like four hours. Still, that’s enough time for an evening shindig. Its portability does come with a handful of caveats. First, it’s not exactly built for outdoor ruggedness, nor is it waterproof. That rules out taking it into the garden or to the beach. And look at that shiny, aluminium finish – oh so easy to scratch. We’d be wary of placing it anywhere where dirt, rain, or cats could get at it. Also, it costs £1000. We wouldn’t dare take such a costly product out of the safe confines of our home. So you’re restricted to moving the Beosound from one room to another, which may well be all the flexibility you need. We’d take extra care when picking it up, too. Hooking your fingers in the gap under the top dial is the easiest way to lift the speaker – just be very careful not to poke the driver underneath. The speaker is also quite hefty at 3.5kg, but it’s not too bad if you’re just moving it to a different corner of the room. B&O’s Acoustic Lens Technology works a treat in the BeoSound 1: the circumaural spread of sound is incredibly wide and evenly dispersed. There’s no sweet spot here – you’ll get the same sound no matter where you’re sitting or what direction you’re facing the conical speaker. In that alone the BeoSound 1 is a success: no other wireless speaker at this price has been able to deliver 360-degree sound quite so convincingly. Crank up the volume and you’ll be surprised by just how loud the BeoSound 1 can go, (almost deceptively so) thanks to low distortion levels. It’s a clean sound, with no jagged edges or lumbering lows to blight the smooth delivery. However, the 360-degree dispersion means there’s an element of diffusion to the speaker’s sound. While that does give the BeoSound 1 an easy-going presentation, it’s also responsible for the vague, hazy quality to the sound. Fiona Apple’s lilting vocals are clear and fluid in Every Single Night, but the delicate instruments too soft around the edges. Rhythmically, they don’t quite gel together. The arrangement is far more expressive and subtle through rival speaker Naim Mu-so (£895), where the celesta and marimba parts have solid depth as well as twinkling delicacy. Voices have more nuance and feeling through the Naim, too. There’s plenty of power coursing through the BeoSound 1, particularly through the low-end. Basslines are powerful and abundant, but they’re a touch heavy-handed and they don’t dig too deep. We want more grip, texture and attitude from the BeoSound 1 when confronted with the fiery, muscular bassline in Rage Against The Machine’s Bullet in the Head. There’s little evidence of the drive and anger coursing through the song. The B&O takes a restrained approach where it should be employing a ferocious transparency – especially for its high price tag. The build up of suspense and doom in Light of the Seven from the Game of Thrones soundtrack is communicated beautifully through the Naim Mu-so, with the resounding piano notes echoing stunningly across deep silences and the cellos coming together with such force in the rousing crescendo. The B&O is less articulate: it doesn’t quite deliver the harmonies surrounding each piano note, and that sense of dread doesn’t come across when the choir and cellos reach their peak. The thing is, while the BeoSound’s smooth sound is pleasing, we imagine you’d want the best possible sound for your money – especially when that money is £1000. And the BeoSound 1 simply isn’t as expressive, precise or dynamically exciting as the Naim Mu-so. The whole point of a beautifully designed high-end wireless speaker such as the BeoSound 1 should be to stand out – visually and musically. And while this B&O speaker will certainly catch your eye, it leaves a lot to be desired when you start using your ears. It has a formidable rival in that department in the form of Naim’s stunning Mu-so. For £1000, you want to be looking at a statement piece. And the B&O BeoSound 1 – no matter how stylishly designed – isn’t the one we’re looking for.